Côté Cour Beijing — hello GETAWAY! It feels really authentic to stay at a place like this when visiting Beijing. 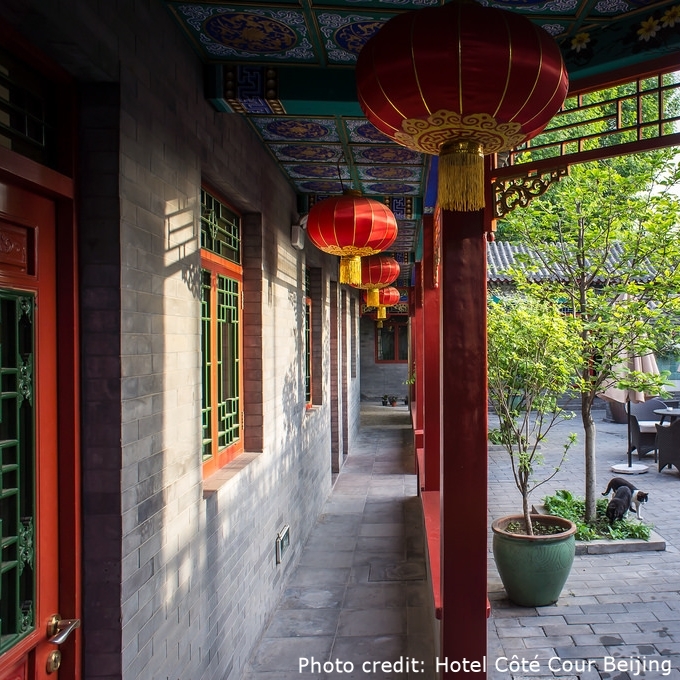 It's a real experience to stay in a building with so much history situated in one of Beijings oldest areas. It is very quiet and not a lot of personell which we really appreciated. The rooms are nicely designed with super comfy beds and very nice bathrooms. All rooms have doors out to the common yard. At the common yard there are chairs where you can sit and enjoy your stay and the fish pond. We loved sitting in the loungers at the roof top. There is also small common spaces indoor. For example a small reading area where you can sip your evening tea while browsing books and travel magazines. There is a great dining area on the roof in a glazed roof garden. The dinner at the small bar up the stairs was very good with homemade dumplings. It is also here you have the breakfast which for us was above expectations. It is a quite simple breakfast, but that it comes with choices makes it feeling luxurious. We enjoyed a tasty western version accompanied with the best tea. The personell is super friendly, and they helped us with everything we needed. I totally recommend this awesome spot for everyone visiting Beijing. I stayed here when I had a 24 h stopover, and I am longing for the day I will go back!